In most cases the type of malnutrition children suffer from is of a moderate and chronic kind. We use the expression “invisible killer”, because the children do not demonstrate visible clinical symptoms. However, the repeatedly recurring nutrient deficiencies have disastrous consequences on the child’s health: They weaken their immune defence systems, delay their overall development and increase their mortality risk. A lasting improvement of these children’s nutritional status is the fight pursued by Antenna. If I had to give a definition of malnutrition, I’d say, that it refers to an unbalance between the nutrients received by the body and the body’s needs in nutrients. Malnutrition is a disease, which is considered to affect over 165 million children under 5 years of age in 2013. A child is malnourished when its food intake is insufficient in quantity and quality. Is it right to say, that there are several types of malnutrition ? Yes, indeed. There are two types of malnutrition: chronic malnutrition and acute malnutrition. Chronic malnutrition leads to a delay in the child’s development. More precisely, their growth is delayed due to persistent nutrient deficiencies over a long period of time. This is the type of malnutrition we tackle here at Antenna Technologies. Malnutrition is said to be acute, when the body reaches a stage, where it starts to feed off its own tissues to find the energy and nutrient components necessary to its survival. In this case, malnutrition becomes life threatening, and quick and efficient action is in this case crucial. But aren't hunger, famine and malnutrition pretty much the same thing ? Hunger is a physiological sensation that calls for a behaviour, i.e. searching for food. The FAO measures hunger by calculating the ratio between a country’s agricultural harvests and its population. Famine refers to a deprivation or disappearance of food on a large scale, in a given territory and over a long period of time. Finally, malnutrition depends first and foremost on the quality of the foods absorbed, i.e. their nutritional value. UNICEF measures malnutrition by taking the ratio between the weight and height of a given population. I would add that the international community focuses nowadays more on the delay in children’s growth, an insufficient height relatively to their age, as an indicator of under-nutrition. In fact, in May 2012, the World Health Assembly, the decision-making body of the WHO (World Health Organisation), agreed upon a new goal: to reduce by 40% the number of children under the age of 5 suffering from a delay in growth by 2025. The first 1,000 days of a child's life are often stressed as being crucial. Why is that ? Yes, indeed. Until recently, one considered the 5 first years of a child to be crucial. Now, more or more, one tends to look at the first 1000 days, from the pregnancy up until the child reaches 2 years of age. One must stress that a delay in growth influences negatively brain development. The mother’s nutritional status and overall health thus play a crucial role in delaying the infant’s growth. A malnourished mother is more likely to give birth to a child suffering delayed growth, which perpetuates the vicious circle of malnutrition and poverty. How can one spot a malnourished child ? In the case of chronic malnutrition, it’s difficult to spot cases, because there are no visible spectacular symptoms. This is why one speaks of a silent or invisible killer. The child’s aptitude at school and in sports is weakened, their hair becomes red and they are too short for their age. The child has various deficiencies, but their body is not yet feeding off the fat reserves or muscles. The body is vulnerable but there is still time to act. But do we know what the real causes of malnutrition are ? Another cause of malnutrition is the lack of sanitary installations. To date, one billion human beings do not have access to drinking water. Infectious diseases spread among children, such as diarrhoea, which makes absorbing food more difficult and reduces children’s appetite. The consequences: growth delays and other forms of malnutrition. Access to drinking water and basic hygiene have to be made possible by eliminating open defecation, by learning to wash one’s hands with soap etc. Breast-feeding must also be encouraged, which in certain regions, where drinking water is not available, is a firewall against the risks of infection. More than just food, maternal milk is the first vaccine as it protects infants from diarrhoea and respiratory infections whilst stimulating their immune system. Malnutrition problems arise, when the infant is abruptly weaned and takes in food with very poor nutritional value. The desperate mothers do not understand why their baby suddenly loses energy and its health declines. 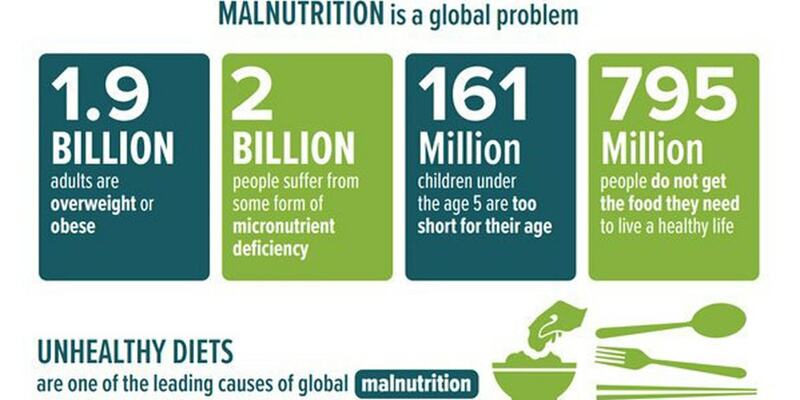 What are the consequences of malnutrition ? Malnutrition has multiple consequences as it affects simultaneously the children’s health, the economy and the education level of the country. The children are of course the first ones to be affected with the countdown of the first 1000 days, from the time of conception up to the age of 2, when the organs and tissues have formed, amongst others the brain and the bones. During this time the child’s full physical and cognitive potential is defined for the rest of their life. A child’s future therefore completely depends on its food intake as a foetus and during the fiorst months of their life. If malnutrition is not tackled early, it will cause irreversible handicaps in their development. To name two deficiencies among the most common ones : deficiencies in iron, which may cause fatal anaemia cases or lead to a decrease in productivity. As always, women and children are the most vulnerable. 4 to 5 billion people are estimated to suffer from this deficiency. Anaemia increases the risk of haemorrhage and septicaemia during childbirth. These women give birth to premature babies or light-weight babies, who suffer from repeated infections due to their weakened immune system and later on, if they are able to survive, will suffer from learning and development disorders. Deficiencies in vitamin A can cause blindness or for the immune system to weaken. At the global scale one child out of three under the age of going to school, and one pregnant woman out of six suffer from deficiencies in vitamin A, because of an inadequate food intake. Vitamin A stimulates the immune response. Children with these deficiencies face a higher risk of dying from an infectious disease such as measles or diarrhoea. Vitamin A supplements provided to children between the age of 6 and 59 months have proven very effective in the decrease of mortality in countries, where this deficiency constitutes a public health issue. Source UNICEF April 2013. Each year millions of children die prematurely, malnutrition having consequences on society as a whole. Infectious diseases, neurological and physical handicaps, fall in productivity among adults resulting from these deficiencies; all of this has a direct influence on the nations’ economies, costing them 5% of their GNP. In addition, according to UNICEF, it has been found that most countries, which have experienced regular and relatively strong economic growth, have seen an improvement in nutrition among their citizens in the past 20 years. Malnutrition means that children don’t go to school or have difficulties focusing in class. It is a whole country’s education level that is at stake and consequently the country’s future. Most certainly not, but it is crucial to tackle the problem of malnutrition early on, when women are in childbearing age. Early action helps to limit the number of births of stunted children, who are likely to suffer from malnutrition. Carrying out prevention rather than emergency actions before it is too late is more effective. The Antenna Technologies Foundation has a solution to malnutrition: the local production of spirulina.